BIO: Theresa was born in Long Island, New York and has been training in dance since she was 3 years old. She started performing at such a young age because her parents quickly realized that music moved her in a way that other ways never could. Theresa trained as a competition kid in New York, and then slowly transitioned into the convention scene where she fell in love with the environment almost immediately. 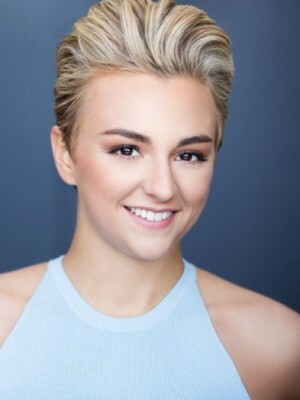 By the time she was 21, she had already had the opportunity to assist and work under great names such as Brian Friedman, Laurieann Gibson, Tessandra Chavez, Cris Judd and more! The hoping for more, she moved to LA to gain more experience as a dance in the industry. Her first big job was dancing for Lady Gaga in her G.U.Y music video. She grew up on Gaga in her high school years, and watched the caliber of dancers she had behind her, and it was goal to one day be one of them. From the video, Theresa was asked to join Gaga's team for the ARTPOP Tour, which to this day, is her most prized achievement as a dancer. The most influential person in her career is definitely Brian Friedman. Since she was the age of 12, it was her goal to continually impress this legend in dance, and she didn't stop until she did. Attending his classes and showcasing her choreography at The Pulse opened the doors to make this possible. From that point on, Brian took her and molded her into the dancer, choreographer and instructor she is today. Helping apply endless amount of wisdom, experience and knowledge through assisting and jobs, Theresa was able to accomplish things that were only in her wildest dreams. Some of Theresa's interest outside of dance are cooking, enjoying time with her family and taking yoga. Her favorite saying is "Everything happens for a reason" because if it weren't for the timing of certain events in her life, some things could have never been possible.